An MCC representative will be at MHS ALL DAY TODAY, Wednesday, May 11, and on Friday, May 13 from 9:00 to 12:00 in the Student Services Office. Employment Opportunity for Upcoming Muscatine Graduates @ Egli Landscapes – Egli Landscapes is looking for hard working team members to join us for a seasonal and/or permanent full-time career opportunity. Job description & application are attached and are also available in Student Services. If you have any questions, please contact Tina Mullin at tina@eglilandscapes.com or at 319-256-5111. Seniors – All library books and materials are due by Tuesday, May 10th. If you haven’t returned items, please do ASAP. If you need to keep a book longer for a class assignment, please contact Mrs. Keltner. Also, a reminder that all library fines need to be taken care of before graduation. Parents – Please check your child or children’s outstanding fee/fine balances online at https://ia-muscatine.intouchreceipting.com/ or by contacting your school directly. Payments can be made online by logging on with your PowerSchool information, in person at school, or at the Board Office. Senior balances will be finalized by the end of the business day on Wednesday, May 18th. All other balances will be finalized by the end of the day on Monday, May 30th. High School Softball Tryouts begin this week, Monday, May 9th through Thursday, May 12 at Kent Stein Field #4 from 4-6 PM. If you have questions please see Coach Stoltzfus. 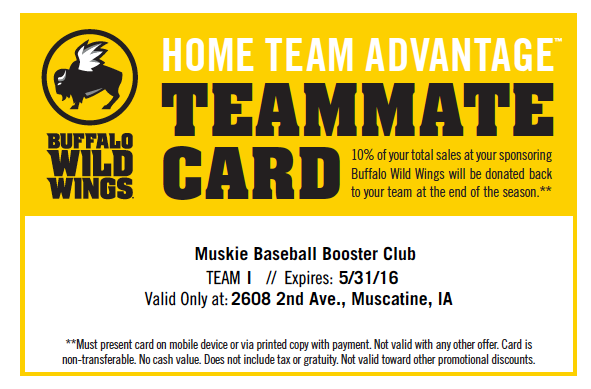 2nd Annual Muskie Baseball Hit-A-Thon – Come out to Tom Bruner Field on Friday, May 13th for a night of fun and to kick-off the 2016 Muskie Baseball season. Gates open at 4pm with a Muskie Alum HR derby beginning around 7pm. There will be a speed pitch, autographed Muskie Baseball bat, raffle for Muskie Baseball apparel, a burrito for a year from Mami’s Authentic, Major League Baseball tickets, White Sox autographed baseball, TAT 2 Bats and more. Eliminate Week – Next week Key Club will be collecting donations for Eliminate Week. Eliminate uses donations to help cure neonatal tetanus. Neonatal tetanus is the cause of many infant and mother deaths, and is caused by non sterile delivery. In order to eliminate this, Key Club will be collecting pennies on Monday, nickels on Tuesday, dimes on Wednesday, quarters on Thursday, and dollars on Friday (Although all change is welcome). College 4 Kids Volunteers – If you love hands on classes and would like to help younger children, this is the opportunity for you!! College 4 Kids is in need of volunteers June 13-June 24 at Central Middle School from 8:00 a.m.-12:00 noon. Please contact: Laurie Schroeder @ 263-0411 or at Laurie.schroeder@mcsdonline.org Deadline to apply is May 20, 2016.Washington Elementary Community Celebration/Open House – 10 volunteers are needed o help at the Washington Elementary Community Celebration/Open House on Thursday, May 19th from 4:30 – 7:30PM. Please contact debbie.ortiz@mcsdonline.org if you are willing to help out!